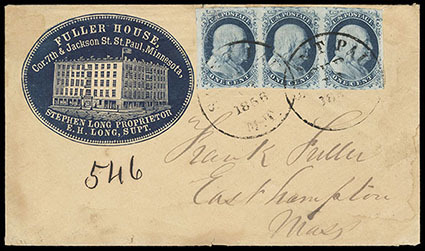 1851, 1¢ blue, type II, horizontal strip of three, clear to large margins, deep color, tied by 1856 "St. Paul, M.T." cds's on blue illustrated Fuller House cameo corner card cover to East Hampton, Mass. ; some faint edge staining and small indent in left stamp, still Very Fine, a wonderful illustrated cameo cover from Minnesota Territory. Scott No. 7 Estimate $600 - 800. 1851, 3¢ reddish orange brown, type I, position 61L1i, margins mostly large to just clear, remarkable intense reddish O.B. color, tied by Montgomery, Ala. cds on 1852 folded letter to Gainesville, Very Fine, a striking color variety; with 2005 P.F. certificate. Scott No. 10 Estimate $200 - 300. 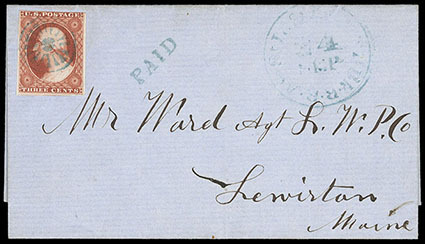 1851, 3¢ orange brown, type II, margins large to into frameline at top, canceled by complete strike blue fancy circle of wedges handstamp (look actually like a locomotive wheel) on fresh folded letter sheet to Lewiston, Me., with matching straight line "Paid" handstamp and "A. & St. L. & A. & Kenbk, R.R. 24" Sep cds, Very Fine, a lovely fancy cancel usage on the Atlantic & St. Lawrence & Androscoggin & Kennebec Railroad; with 2018 P.F. certificate. Scott No. 10A Estimate $300 - 400. 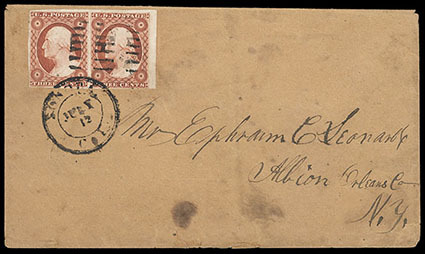 1851, 3¢ orange brown, type II, horizontal pair, positions 9-10L1E, huge margins to full including right interpane corner margins, cancelled by unusual 7-bar segmented grid and tied by matching "Sonora Cal., July 12" three-ring cds on buff cover to Albion N.Y., couple stain spots and some edge wear, Very Fine and scarce orange brown use from Sonora, ex-Eubanks. 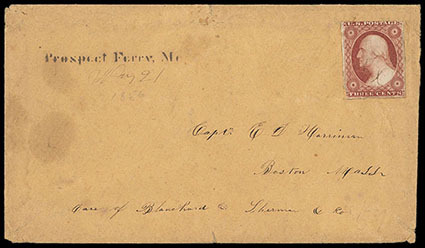 1852, 3¢ dull red, type I, manuscript canceled on cover to Boston, Mass., with straight line "Prospect Ferry, Me." stencil postmark with manuscript date below; small stamp flaws and light cover wear, F.-V.F., a very rare stencil townmark, possibly unique. 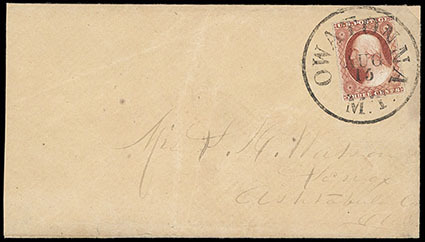 1852, 3¢ dull red, type I, large margins to just touched, tied by perfect bold "Owatonna M.T. Aug 15" Minnesota Territory balloon-style cds on light buff cover to Lenox, Ohio, Extremely Fine and choice strike, ex-Sampson, Chase, Eubanks. 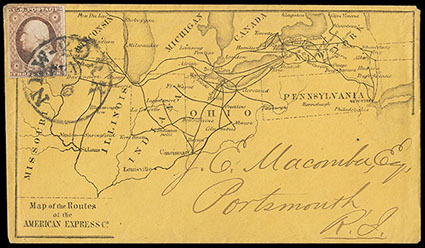 1852, 3¢ dull red, type I, slightly oxidized, tied by New York cds on 1856 printed cover to Rhode Island showing "Map of the Routes of the American Express", Very Fine; with 2001 P.F. certificate. Scott No. 11 Estimate $150 - 200. 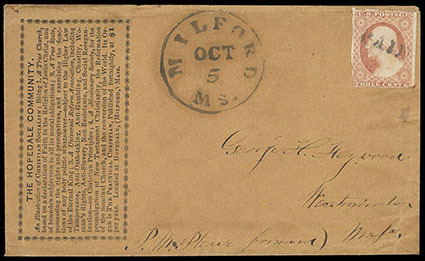 1852, 3¢ dull red, type I, slightly defective, cancelled by straight line "Paid" handstamp on cover to Westminster, Ms., postmarked Milford, Ms. with "The Hopedale Community" printed propaganda at the left. The Hopedale Community was founded in Milford, Massachusetts, in 1842 by Adin Ballou. He and his followers purchased 600 acres of land on which they built homes for the community members, chapels and the factories for which the company was initially formed. The area was later split from Milford and became the town of Hopedale, Massachusetts. Ballou believed that he could create a utopian community blending the features of a factory town with those of a religion-based commune. The community stood for temperance, abolitionism, women's rights, spiritualism and education. 14 years after the land was purchased, Hopedale went bankrupt. 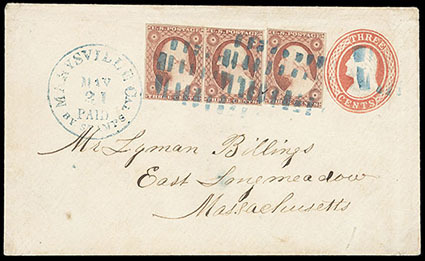 1852, 3¢ dull red, type II, horizontal pair and single, large margins to clear, tied by blue segmented fancy grid cancels, matching "Marysville Cal. 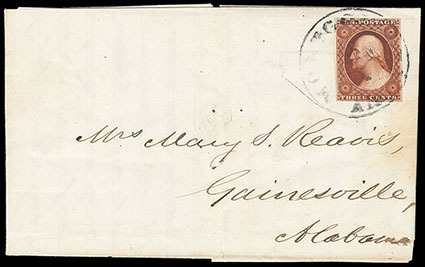 'Paid by Stamps' May 21" cds on 3¢ red (U9) Nesbitt entire to East Longmeadow Mass., flap with red "G.F. Nesbitt N.Y." circular embossing, docketing on back "Dated at Rush Creek May 9, 1855, May 12, three days later brother Homer arrived on Rush Creek"; right stamp in pair light crease at top right, Very Fine. Scott No. 11A Estimate $400 - 600. 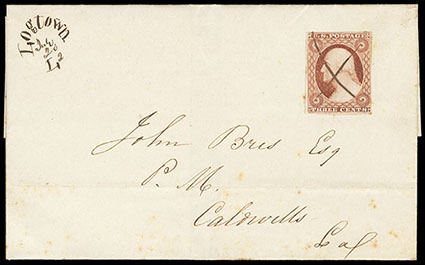 1852, 3¢ dull red, type II, margins large to touching, tied by manuscript cancel on 1852 folded letter sheet to Caldwells, La., with matching manuscript "Logtown, La., July 20" circular town postmark, Very Fine, an attractive and very unusual manuscript townmark. Scott No. 11A Estimate $200 - 300.